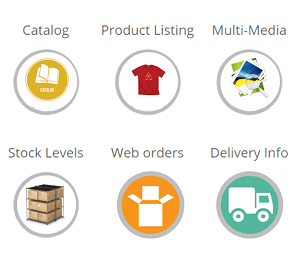 Launching your web store fully integrated with SAP back end can be a daunting task, specially given the fact that master data involved is enormous and so is the complexity of managing day to day activities. Every business wants to extract efficiency in managing online merchandise, control inventory and entire order to cash transactions without overloading your SAP team for months. Coupled up with our solution, AppsEconnect, Bigcommerce is one such eCommerce platforms which gives quick results. The feature set of the solution is designed so that you can get the maximum out of your existing SAP investment. The various integration points described in this article show how closely the two systems can be integrated with each other. You don’t have to make your IT team stretch as most of the master data is already there in SAP and it simply requires you to organize them. The installation is done by our experts for a nominal charge. See demo and details on pricing below. 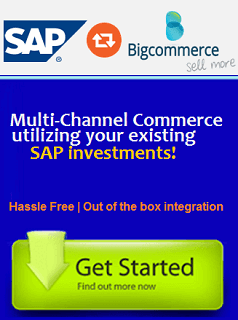 Using APPSeCONNECT, the product categories from SAP ECC are transferred to Bigcommerce. Hence the online store tree structure is created and giving you absolute control on your online store layout from within the SAP back end. The product listings along with their prices as determined by the pricing procedure are transferred as well. You may be amazed to see long descriptions comes in as well from SAP and hence ensuring a completely production ready web store. This integration point helps in ensuring that all your lines of business is intact with your web-commerce platform. For example scenarios like new product launches, de-listing of old products are done automatically without manual intervention. Thus it not only drives business but also helps in eliminating the need of having a large web commerce back end team. Product images make the web store appealing to the end customers. In many cases you need to show the technical specifications or images from various angles to make the customer understand what he is about to procure. Multi-media files associated with products are indeed the elements which persuades and helps the customer in making a decision. Using APPSeCONNECT, you can not only synchronize the product images but also ensure that they are optimized for SEO. Having a central team which manages graphics and associated multi-media and ensure that your web store is not only appealing but also optimized for searches on the internet. This makes your site appealing for the end customer and orients it for maximum revenue generation. You can have multiple images so that it helps customers make decision faster. Pricing in SAP is one of the most complex solutions. Using the solution you can simulate pricing procedure calculation and ensure that your business rules are intact so that condition record changes are reflected in the online store as well. The solution helps you to make just the right revenue and profit margins as set up in the pricing rules of your SAP back end. No need of spreadsheets and manual calculations. Eliminates the area for most crucial manual error. A customer turned away due to no stock levels or under delivered due to lack of goods available, means losing the customers for ever. Its important in today’s world to ensure visibility of goods which are in stock. Presence of requested delivery date feature in Bigcommerce helps in executing ATP as well as getting as efficient as you can. You can map the plant in ECC whose stock levels to be transferred from SAP to Bigcommerce. The stock levels are synchronized to ensure that there is a single version of truth. With your purchasing team having to manage procurement in a centralized manner as per the demand, you can have better control on your inventory management.On the other hands, by being transparent, you garner trust and loyalty from your buyers. APPSeCONNECT helps you get the details of web customers and their orders downloaded into SAP. Thus your back end team has to work just like earlier in terms of order fulfillment. Enjoy the fully integrated solution and increase your business volume without increased load on your operational team. Fulfill your web orders just like any other orders inside your SAP ECC environment. The complete order to cash cycle is automated between the applications. Having an order placed is great. Won’t you want to update the customers when their delivery has been dispatched? When a delivery has been post good issued, APPSeCONNECT, automatically informs the same to Bigcommerce and also feeds it with the tracking number, thus giving a wholesome experience to your web customers. Delight your customers on dispatching their orders. Without any additional steps, you can delight your web customers on doing delivery within SAP. Provide your customers the tracking number so that they can track shipments once you have entered them in SAP. This video demonstrate partial solution encompassing, catalog, products, multi-media and Order synchronization. The video runs through creation of catalog, products listing with attached multi-media and web orders synchronization from Bigcommerce to SAP ECC. There are two options listed below to choose from. The details are mentioned below with the finer details.However, please note that you may want to reach out to us with the details so that we can make a proper scope and quotation document and send it to you. Your business data remains with you!! Data security is of utmost concern when dealing with any integration project. 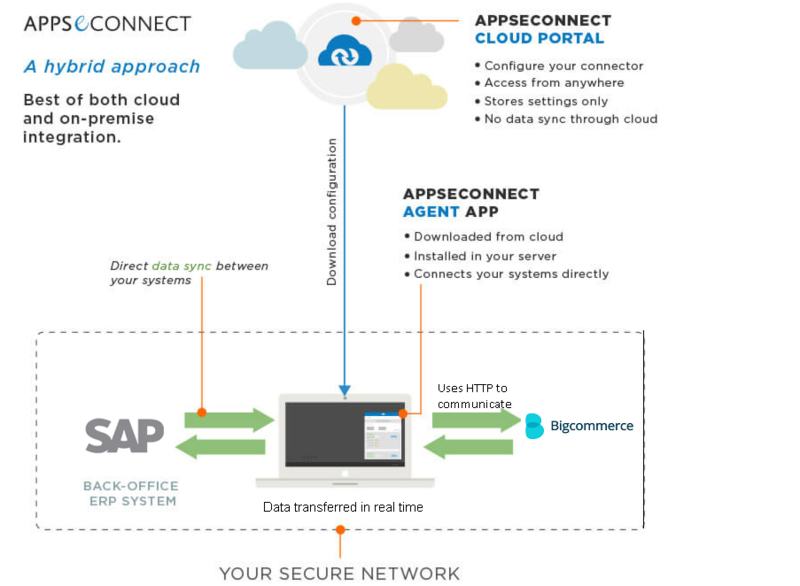 AppsEconnect is a hybrid connector which helps you to use configuration done in the cloud and then downloaded into an “Agent” on your promise which then drives integration. Thus your business data always remain in your network. Also you get complete control on the frequency of synchronization and other control parameters according to which your synchronization need to work. Read more about AppsEconnect below. APPSeCONNECT is a proven pre-configured solution which can make your on-line business scale new heights. You are no longer required to undergo the usual requirement to implementation. The solution works out of the box and is being used by over 110 customers in over 30 countries. We understand that not all businesses run the same way. The solution can be configured anywhere from the cloud and the mappings can adjusted. However your business data never leaves your premises. APPSeCONNECT provides best both cloud and on premise deployment. The solution is backed up by a solid support framework. You need to only manage your business and leave aside the integration work to the platform. What’s more, as the new feature get rolled out you get to use them within your subscription or AMC agreement. Founders at Veon have a rich experience in integrating web application over SAP ERP back office for big players like Daimler AG, Proctor and Gamble, Boots Plc and Rio Tinto. Our rich experience in this domain and our partnership with APPSeCONNECT, has put us in position where we have delivered value for money integration projects on top of SAP ECC infrastructure. Our core expertise include web based order to cash web applications, multi-channel commerce and customer relationship management domains. Some of our other solutions include integrating SAP with Salesforce, SugarCRM, Magento e-commerce. Get in touch with us to evaluate whats best for your business.